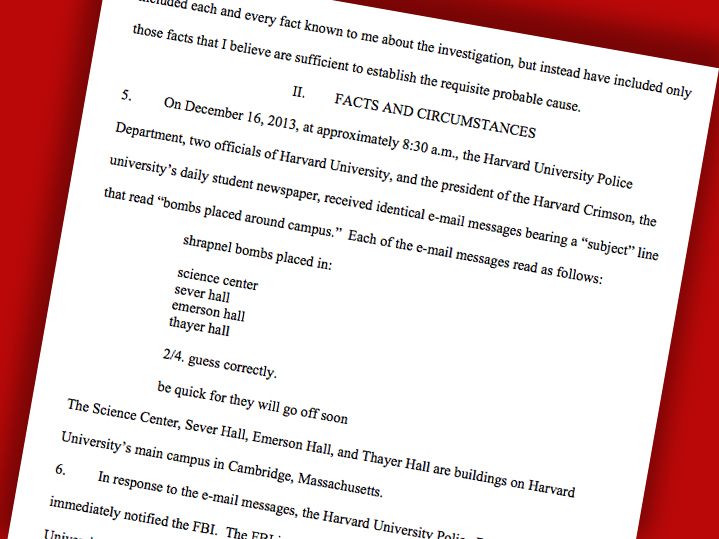 Sophomore Eldo Kim has been charged by U.S. prosecutors with e-mailing bomb threats that shut down four buildings at Harvard on Monday during final exams, report several news sources, including The Harvard Crimson and The Boston Globe. Charged with a single count of making a bomb hoax, Kim is facing up to five years in prison and a $250,000 fine, according to a statement from U.S. Attorney Carmen Ortiz. According to the Globe, his initial court appearance is set for tomorrow before U.S. magistrate Judge Judith Dein in Boston, and he will be represented by a federal public defender. For extensive coverage of these events as well as background information on Kim, see coverage in The Harvard Crimson.